Accomplishments or why King Henry I was famous: Restoring the English laws of King Edward the Confessor. "He was of middle stature, greater than the small, but exceeded by the very tall; his hair was black and set back upon the forehead; his eyes mildly bright; his chest brawny; his body fleshy." 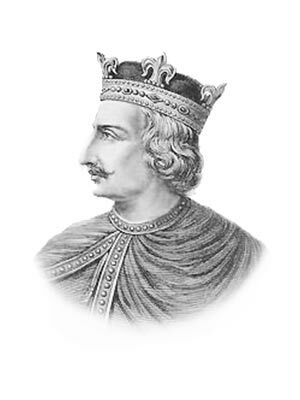 Henry, was the brother of William Rufus, and was one of the hunting party when King William Rufus mysteriously died. As soon as the cry spread through the forest that the king was dead, Henry rode off at full speed to Winchester, and took possession of all his brother's treasure. William Rufus had never married and left no heir to the throne of England. Henry claimed England promising to govern according to the old laws of England. As king, Henry carried out social and judicial reforms which included issuing the Charter of Liberties and restoring the English laws of King Edward the Confessor. Henry married a half English lady called Maude (1080-1118) on 11 November 1100. Maude was the daughter of Malcolm Greathead, King of Scotland, and of the old English royal line. She was actually christened Edith, but her name was changed to Maude or Matilda on her marriage, as a compliment to the mother of her new husband, King Henry I. She was greatly loved by the English who called her 'Good Queen Maude'. Queen Maude died in 1118. Robert, the older brother of King Henry I, returned from the Crusades and tried to make himself King of England. Henry soon drove him back to Normandy. The brothers continued to argue for some years, and Robert managed Normandy badly, and wasted his money. Some of the Normans could not bear this any longer, and invited King Henry to come and take the dukedom of Normandy. King Henry I led an army, many of whom were English, and fought a battle with Robert and his faithful Normans at Trenchebray, in Normandy. King Henry I gained a great victory, and the English thought it made up for Hastings. Robert was made prisoner by his brother, who imprisoned him in Cardiff Castle, in Wales, where he lived for twenty-eight years until his death. King Henry I, Beauclerc claimed the title of the Duke of Normandy. Henry and Maude had two children called William (1103 – November 25, 1120) and Maude (1102 – September 10, 1167). Young Maude , her Latin name was Matilda, was married to the German Henry V, the Holy Roman Emperor and the boy William was to marry to Isabella d'Anjou, daughter to the Count of Anjou. Twelve year old William was taken by his father to Anjou, and there married to the little girl, and then she was left behind, while he was to return to England with his father. Just as he was going to embark, a man came to the king, and begged to have the honor of taking him across in his new vessel, called the White Ship. Henry could not change his own plans; but, as the man begged so hard, he said his son, the young bridegroom, and his friends might go in the White Ship. They sailed in the evening, and there was great merry-making on board, till the sailors grew so drunk that they did not know how to guide the ship, and ran her against a rock. She filled with water and began to sink. A boat was lowered, and William safely placed in it; but, just as he was rowed off he heard the cries of the ladies who were left behind, and caused the oarsmen to turn back for them. So many drowning wretches crowded into it, as soon as it came near, that it sank with their weight, and all were lost on 25 November 1120. The impact of White Ship disaster was that it left Henry with no male heir. On 29 January 1121, King Henry I, Beauclerc, married Adeliza, daughter of Godfrey I of Leuven, Duke of Lower Lotharingia and Landgrave of Brabant, but there were no children from this marriage. King Henry's daughter Matilda had lost her German husband, and came home. Henry Beauclerc made her marry Geoffrey of Anjou, the brother of his son's wife. Henry then called upon all his chief noblemen to swear that they would take her for their queen in England, and their duchess in Normandy, after his own death. He did not live much longer. His death was caused, in the year 1135, by eating too much of the fish called lamprey, and he was buried in Reading Abbey. The barons who had vowed to support the accession of Matilda to the throne reneged and Stephen, Matilda's cousin, seized the throne. Some interesting facts and short biography information about the History, Life & Times of King Henry I. Additional details, facts, history and information about the famous Medieval Kings of the Middle Ages and important events during their times can be accessed via the Middle Ages Sitemap and the section detailing the life and times of the Kings of the Middle Ages.